For the past three years, a quiet revolution in AC power has been taking place in professional audio and video. The Symmetrical Power System, introduced by Equi=Tech in Oregon, takes normal power supplied by the local utility and balances it, providing two 60-volt AC legs, one positive, the other negative, with 120 volts AC between them. Balanced AC lowers audio and video noise levels and increases dynamic range. Equi=Tech was started by Martin Glasband to manufacture Symmetrical Power Systems. Interested readers should check out Glasband’s November 1994 Mix article “Lifting the Grounding Enigma,” also available on Equi=Tech’s Web site (www.equitech.com). Glasband is also the author of National Electrical Code Article 530 G, which allows the use of balanced AC for audio and video systems in the U.S.
Art. 530 G thereby expanding the use of balanced AC to include all sensitive equipment locations. Since the beginning, 120-volt American AC power has been unbalanced, with a 120-volt hot wire, a 0-volt grounded neutral wire and a 0-volt ground wire. Symmetrical power transforms this into two 60-volt hot wires that are in phase with each other and out of phase with respect to ground. This is referred to as Common mode, and, just like in audio circuits, this balanced topology cancels noise. With unbalanced AC, reactive currents are reflected by equipment onto the neutral and ground, causing ground noise. Furthermore, unbalanced RF filter caps leak voltage to ground. With balanced AC, reactive currents are inversely phased with respect to ground so they cancel each other out, and balanced filter leakage is inversely phased, so the ground stays clean. Our Field Test, at Portland’s Key Largo club, used two of Equi=Tech’s 20-amp rackmount ET2R Symmetrical Power Systems ($1,529 list). 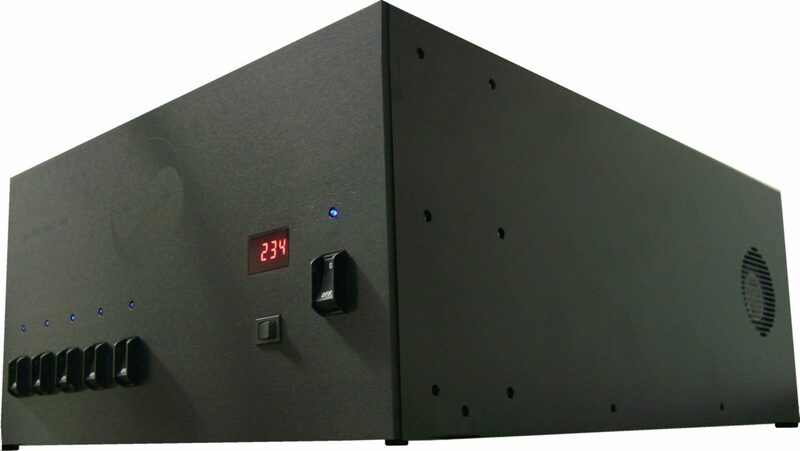 Six models of rackmount systems, with capacities of 10, 15, 20, 30, 40 and 50 amps, are available in a three-space, heavy-duty chassis. The smaller-capacity units plug right into standard 15 or 20-amp 120-volt wall outlets, while the larger units plug into standard 250-volt receptacles. Weight varies from 30 to 108 pounds, as capacity is determined by the size of the precision-wound toroidal power transformer. For permanent installation, Equi=Tech manufactures prefabricated wall systems with 5, 7.5 and 10KVA capacity. Equi=Tech also sells custom transformers up to 333 KVA and provides engineering services. The two 20-amp ET2Rs were simply mounted in the bottom of the equipment rack, and each plugged into one of two 20-amp wall outlets. The Carver monitor amps, Soundcraft console and Symetrix processing we were using ran on one ET2R, and the Stage Accompany mains ran on the other, as they had higher peak demands, especially the subwoofer amps. No special wiring was needed. Aside from rackmounting, changing over consisted of taking a moment to re-plug the AC cables. Equi=Tech’s mottoes are “ground everything and lift nothing” and “throw away your ground lifts.” All equipment was simply plugged into the Equi=Tech units. The ET2R acts as a 20-amp power strip that isolates from the grid and immunizes local problems. Equi=Tech’s technical bulletin “How to Do an Audio System Noise Floor Test” ships with the units and provides a helpful out-line for verifying performance. Equi=Tech guarantees customer satisfaction and encourages users to test and verify the improvement to their sound system’s specs. For testing, we used a Neutrik A2-D audio test system. Self-noise on the Neutrik A2-D was measured at 108 dB and at 111 dB, weighted 20 to 20k Hz, and running it on balanced power made no difference in this measurement. One important note is to let all equipment under test warm up for at least half an hour, during which time its circuitry is stabilizing and the noise floor can be seen to slowly drop several dB. We first sent a 1kHz tone at +4 to establish a unity gain structure, important to accurate noise floor measurements. Then, with all components warmed up and the tone off, measurements could be made. The improvement on any single channel was about half of a dB. With 32 channels and effects returns summed, a typical mix scenario, the measured noise floor dropped by 12 dB unweighted and 6 dB weighted 20 to 20k Hz, showing elimination of garbage both within and outside of the audio spectrum. An additional 3 dB of improvement, unweighted, was seen on the power amp outputs for a total improvement in system noise floor and dynamic range of 15 dB unweighted. While you have your November ’94 Mix out, also check out Zelniker and Taylor’s “Insider Audio” piece on digital jitter. The term “jitter” refers to timing errors in a data stream, which can manifest itself as digital errors or system crashes. Jitter is a cumulative effect and can increase in chains of equipment. Our measurements of the output of a single Panasonic SV-3800 DAT showed that running on balanced AC cut jitter in half, from 6 nanoseconds average down to 3 ns. The peak jitter level was improved threefold from 18 ns peak down to 6 ns peak. Equi=Tech says this is probably due to balanced AC eliminating ground noise at digital audio data stream frequencies (which is at about 700 kHz for 16 bit/44.1k audio). It is possible to run only a portion of your P.A. on balanced power. Most noise in a P.A. system is generated by the mic preamps and summing amps of the console, the processing and the backline. Leave the power amps on unbalanced AC and simply lift Pin 1 at the input of the amps to keep the amps from contaminating the rest of the system using balanced AC. Later that week, one visiting engineer commented that his band recorded a live album in the club several years previous that had been all but ruined by the noise that was captured on tape. With the advent of 20- and 24-bit digital, the noise floor of new systems is low enough to reveal a multitude of hums and buzzes. The technical department at Equi=Tech has a plethora of success stories they are happy to share that illustrate the power of symmetrical AC technology to eliminate audio problems. Does this make an audible difference for live sound? Have you ever had to listen to an in-ear mix with a low-level buzz all night? Have you ever had the ballad ruined by noises you spent your entire dinner break trying to track down? The only complaints come from the occasional guitar players that miss the reassuring hum coming off their backline.